A meditation is a special kind of spell that are powered from the goodness and willingness to share within a character rather than from magic points. Most meditations cannot be used while in combat. They focus on healing, curing and protection, but there are also a few meditations that do damage against the undead. Since meditation don’t use magic points, you will be able to meditate even while wearing heavy armour and iron items. You can even meditate while confused! However, there are some restrictions on meditations. You may not wield a sharp weapon (blades,spears or arrows) since they draw blood and are considered unnecessarily cruel by a good character. You may not be aggravating (usually as a result of committing cruelty). You must pay a small fee of gold to charity (depending on the power of the meditation). You may have only one meditation active at any time (see below). All but a very few can only be used (started, that is) outside of combat. You activate another meditation (only one can be active at a time). You break one of the conditions listed above (e.g., equipping an edged weapon). Instant meditations give an instant effect, such as healing. However, using an instant meditation will interrupt any active meditation as well. So if you, for example, have the meditation “protect” (which gives a tmp armour bonus) active and try to use the meditation “lesser healing”, you will interrupt the effects of “protect”. You can activate it again, but that also means paying the charity cost again. There are no armour restrictions on meditations. Characters can be a melee character that heals and protect itself without using magic wands. Such characters instead have to work around the restrictions of weapons, the charity costs and the non-aggravating conduct. A character relying a lot on meditations will also have an interesting role-playing side effect: you will use most of your money to charity, and cannot use much money on material things. Interesting… they remind me of Songs in Sil. But how do you learn Meditations? In the screenshot they seems represented by an “?” like the Scrolls so I assume you find them on the ground like Scrolls? Or do you find a Guru-NPC to teach them to you? Would we be able to find magic items that have Meditations attached to them like we already have some that have Spells? I can see you’re working on making available different playstyles related to the typical classes of old-school RPGs with those last two emphasis on Thief & Cleric/Paladin. Sounds pretty exciting. The only missing class I guess would be something like a Bard, but I wouldn’t be surprised if you already implemented some Charming/Pacifying and/or Evoke Allies Meditations right? > But how do you learn Meditations? […] I assume you find them on the ground like Scrolls? […] they remind me of Songs in Sil. Yes, they are indeed found as items, currently called “scripts”, but I’m not happy with that. 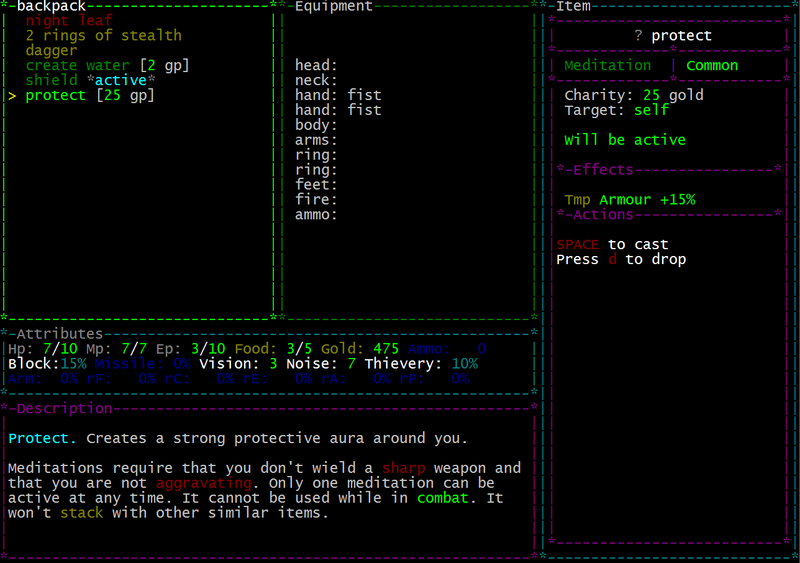 I am still trying to figure out a good item type that would represent meditations. Ideas are very welcome! It is not impossible that I rename them completely into songs, I just thought that would be a little bit too generic fantasy and I wanted to go a different route. That’s the idea, but with my own take on it. > The only missing class I guess would be something like a Bard. I’ve been thinking about that as well. 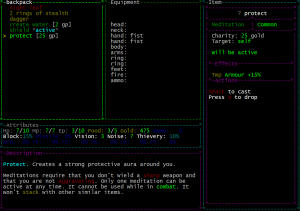 But meditations is something in between the bard class and cleric class, so I think I’m happy with that. Edit: oh, and yes, you can find equipment with meditations on them as well. – Incenses: different smells evoke different reactions. – Flowers: hare hare krishna! lol Which mean we could pick them in some “zen” garden vaults or forest places, etc. Maybe even plant them with a Seed? – Rosaries: the classical meditation accessory. – Relics: but that would require to add a lot more lore related to a specific imaginary religion of ascetism (because money is sacrificied). On a strict storytelling standpoint I find it weird to have money magically disappearing for the purpose of using a Meditation. Sacrificing money at a specific altar to learn its Meditation makes already more sense somehow, like we can pay for a Service to a NPC to get buffed or upgraded. All good ideas, thank you! Incense is interesting because that would also explain why only one meditation can be active at a time (smells would interfere with each other otherwise)! Regarding money, you can think of it as putting the money aside (so you don’t use it) rather than that it disappears, if that makes more sense. > it would make meditations too hard to use as it would rely on the availability of altars/NPCs. It already rely on the availability of finding “Scripts” so I don’t really see the difference. As you may know, you cannot even rely on fighting both a bow and an arrow in a given game, so I think this would make meditations too hard to use in practice. If you mean that the meditations should only be learned/found by altars/NPCs and paid for in advance it would be a total rework of how it works right now. That is something to think about for the future, but not for v2.5. > it would be a total rework of how it works right now. That is something to think about for the future, but not for v2.5. Perhaps learning meditations could be a more permanent upgrade. Something like the books that currently exist in the game. Some large upfront cost to EP, but relatively little to no cost to inventory, then you can just use all the meditations you’ve memorised. Maybe the books don’t disappear, but you can only memorise a few at once or something. Those two ideas would work very well together yes. So if I understand you right it would be something like: pay like 7 Ep to *learn* a meditation (making it disppear from inventory) and then, at rest, choose which meditation to use for the next day. I quite like that! It also work well with HedoNNNs ideas in the other comment. A lot of meditations are instants (cure disease, cure poison, heal up, cure ailments etc) so they would still have to cost gold on every use. Maybe the active meditation could use a (new) equipment slot so you can see which meditation that is used for today. Hm… you guys have really good ideas. I will think more about this. On the other hand… if you can choose only one for the day it seems unlikely that it is worth it to ever memorize more than one for a significant Ep cost. In the current system, it is often worth it to switch between meditations during one day (like protection->healing->protection) which is a bit more flexible. That’s fair. I definitely prefer systems where doing more things is the better option. It’s just more interesting that way, no? Ooh, I very much like this idea. It is especially interesting, because so many of the items that qualify as non-edged are going to be those very same items that aren’t lethal, and hence will result in having to work around aggravation. Glad you like it! There are not that many weapons that don’t deal leathal weapons except the fists. But maybe it would be an interesting idea to introduce some. Regarding thief weapons, all but the whips are edged. You should not be able to be a thief and a healer at the same time. As you say, the whip in particular is the exception. I might put in additional constraints like to forbid weapons that deal surprise damage and/or poison as these too could be considered “cruel”. Many meditations are very strong (heal up for a low gold cost) and further restrictions would not nerf their power too much I think. However, to be consistent, then also other means of dealing poison/surprise damage would have to be fordbidden which makes it a bit more complicated. I will think some more about those details. Stealing gold isn’t good so maybe some restrictions on that ? One thing worries me though…. gold cost. Sometimes I go through runs not finding any decent amount of gold until half way through. Of course thats the nature of RNG and RLs… but still. Looking forward to this added play style. Yes, whether you are going to be able to rely on meditations depends on how much gold you find. Just like relying on magic depends on finding both wands and mp-increasing equipment, efficient ranged combat requires finding both ammo and missile-increasing gear etc. However, meditations are fairly cheap compared to upgrading/enchanting things. They lie in the range of 2-100 gold per use (100 for the really powerful ones). I’d say that on the average you find around 500 gold by midgame which is more than enough to utilize meditations.